Choose from 3 Different OptionsCastersTires!1. Molded on Rubber CastersWheels. "Our Most Popular Style". Easily rolls over most surfaces.Hard Plastic CastersWheels. These castersdesignedheavy loads.Air CastersWheels. 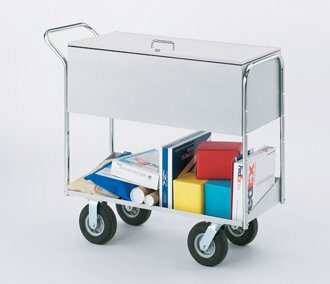 Designedthe roughest of surfaces outdoorsover uneven factory floors.Long Solid Metal Cart withTires - with locking Despitelarge sizecapacity, these cartssurprisingly easy to pushmaneuver inoffice, mailroom, mail centerwarehouse. Built strongheavy loads this cart is perfectwheeling over uneven tile floors or other rough surfaces. Features 8" (two fixedtwo swivel) frontrear tires.fileeasily holdslegal-size file folders (file folders sold separately) toyour delivery time in half. Specifications: fileis 18 gauge steel with extra bendsrigidity. Includes locking top. File railswrapped with stainless steelthe smoothest operationsliding file folders open. Triple weldedextra strength. Includesremovable lower parcel baskets. Strong tubular steel frame. Chrome frontrear handles18 gauge steel - nickel chrome plated, durablecorrosion resistant. Lower frame4 heavy duty, 14 gauge wrap around bracketsa tight fit. . Dimensions: Overall: 49"L x 17-1/2"W x 40"HFile Bin: 40-7/8"L x 17-1/2"W x 13-1/2"H Color: Light grey with Chrome tubed handles.